• Deperming ranges which are designed to modify the magnetic signature of vessels to within acceptable levels. Degaussing ranges typically consist of a linear array of magnetometers located across a navigation channel near a Navy installation. 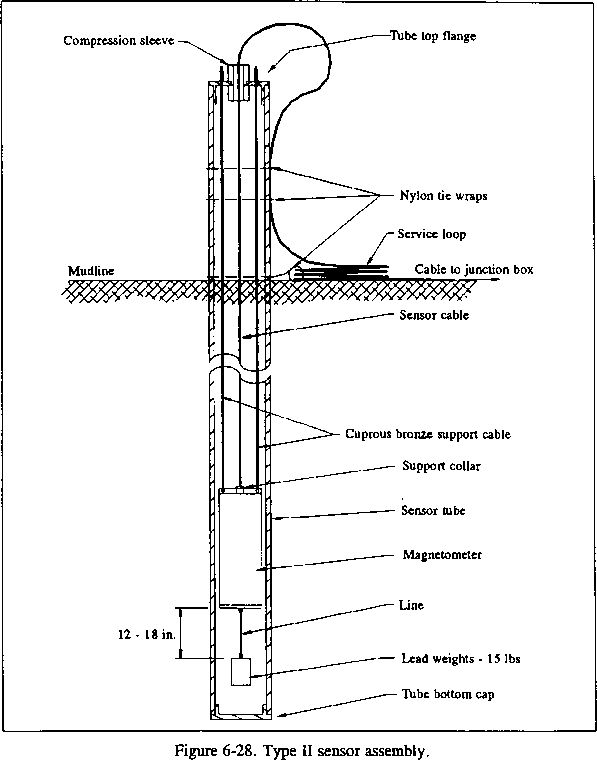 These magnetometers, or sensors, are placed inside support structures and are connected to an instrumentation building by cables that provide power and a medium for data transmission. Typically, these support structures consist of fiberglass or PVC tubes embedded in the bottom. In some cases, more elaborate support structures are employed, depending upon local bottom conditions and facility requirements. Deperming ranges are located either adjacent to a single pier or between two finger piers. Similar to degaussing ranges, sensors are positioned within support structures, usually bottom embedded tubes. Cables connecting the sensors and the range house also supply both power and data transmission. Hie installation of the support structures for magnetometers is not addressed in this manual due to the extensive engineering support and high degree of accuracy required for their installation. There are some variations in the method of installing sensors and sensor cables de pending on both the type of range and the type of system that is used at a particular range. 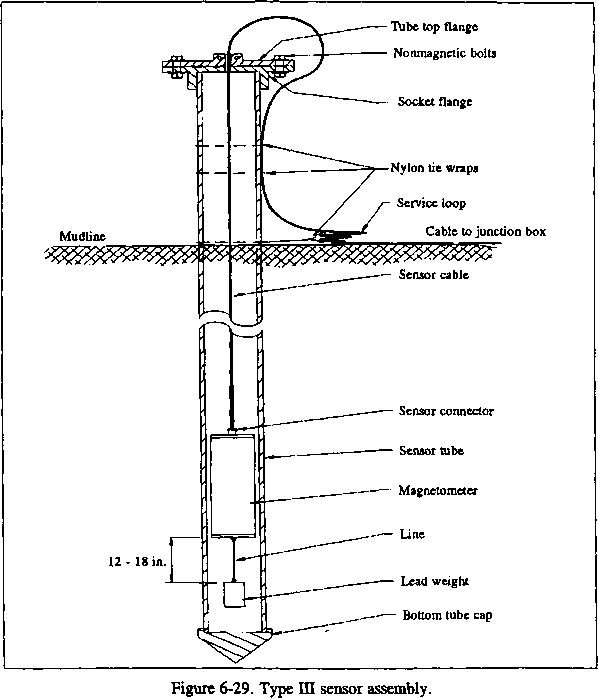 Common among all the systems currently in use by the Navy is the fact that a range will consist of sensor support structures (usually tubes), magnetometers, weights suspended from or attached to the sensors, tube caps, and sensor cables. Figures 6-28 through 6-31 illustrate a typical configuration for the different systems. Above water electrical installations are usually not part of the mission assigned to UCT personnel. • Cut the bronze sensor support cables to the proper lengths and attach them to the sensor with the support collar and to the tube cap as shown in Figure 6-28. • Pass the sensor cable through the tube top cap and attach it to the sensor. • Just prior to installing the sensor in the tube, attach the lead weight to the sensor with an appropriate marine grade line. 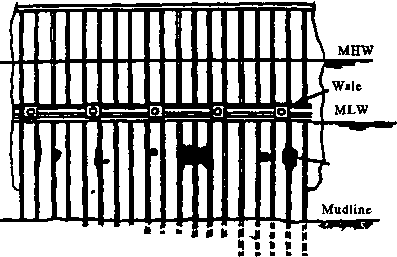 The weight should suspend beneath the sensor approximately 12 to 18 inches. • Insert the sensor assembly into the tube. The tube top cap sits inside the tube, therefore no fastening devices are necessary. Secure the sensor cable to the outside of the tube with nylon tie wraps. The cable loop protruding from the tube top cap should not exceed the minimum bending radius specified by the cable manufacturer. the surface without disturbing any adjacent cable. 10 feet with tie wraps. Cables are routed through protective conduits near the junction box(es) and secured in place. • Measure on the sensor cable the appropriate length from the tube top flange to the cable connector. Attach the tube top flange to the cable. • Prior to connecting the cable to the sensor, replace the cable connector O-ring with a new lubricated O-ring. • Attach a lead weight of approximately IS pounds to the bottom of the sensor with marine grade line. The weight should suspend from the bottom of the sensor 12 to 18 inches. • Lower the sensor assembly into the tube, align the tube top flange with the socket flange preassembled on the tube, and secure in place with nonmagnetic bolts. • Secure the sensor cable to the outside of the tube with nylon tie wraps. The cable loop protruding from the tube top cap should not exceed the minimum bending radius specified by the cable manufacturer. • Coil a service loop of cable at the mudline and secure to the tube with tie wraps. Service loop should be of sufficient length to enable servicing the sensor from the surface without disturbing any adjacent cable. • Each cable should be routed along the bottom to the appropriate junction box(es). Groups of cables are bundled together (usually four to eight) and secured approximately every 10 feet with tie wraps. Cables are routed through protective conduits near the junction box(es) and secured in place. • Locate the underwater junction box (UJB) and bring it aboard the work platform. • Terminate to the UJB the sensor cable to the first sensor in the array and the return sensor cable that connects the last sensor in the array. • Make up the sensor assemblies by attaching the proper length synthetic line between the Viking cap and sensor, pass the sensor cables through the Viking cap, connect the cables to the sensor, and attach the proper Cap Tag to the Viking cap. Check sensor cable connector O-rings prior to mating cable to sensor. Replace any defective O-rings. Ensure ballast (lead weight) is attached to the bottom of the sensor. • Lower the first sensor in the array along with the UJB to the bottom. Remove the temporary cap, if any, from the sensor tube. Ensure the tube is clear of debris and sediment. Insert the sensor into the first tube. Place the UJB on the Range House side of the first tube. After the Viking cap is placed over the tube, ensure that the clamping ring on the cap is closed and secured. Secure the sensor cable to the side of the tube with tie wraps as depicted in Figure 6-30. • Install the remainder of the sensors in the array in a similar manner. While installing the sensors, pay out the return sensor cable. As mentioned above, this cable will terminate at the last sensor in the array. Figure 6-31. 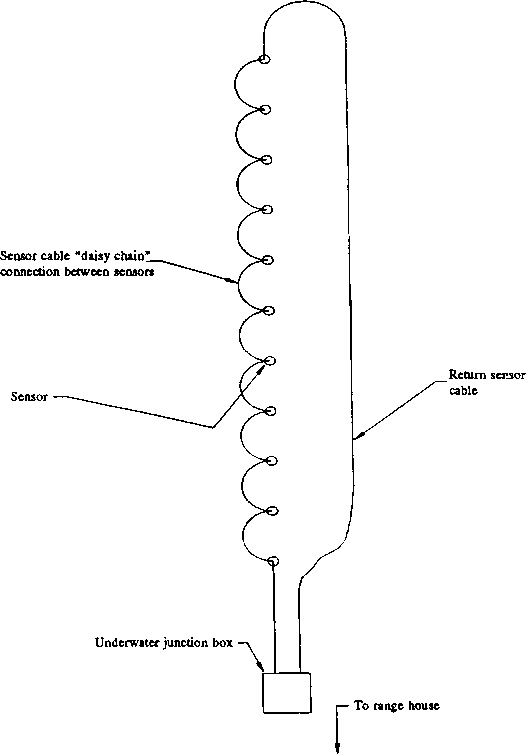 Type IV sensor cable configuration. • As illustrated in Figure 6-30, each sensor has two service loops, placed and secured on either side of the sensor tube. Each service loop should be of sufficient length to allow servicing an individual sensor from the surface without disturbing any adjacent cable beyond the service loop. 6.4.1.4 Sensor Assembly Replacement. Numerous magnetic silencing ranges have been installed in dredged cuts that have filled in naturally or were backfilled after installation. When replacing a sensor assembly, it should be necessary to uncover only die tube and service loops of the sensor to be replaced. Once a sensor has been located and brought to the surface, replacement of the assembly follows die same steps listed above. Ensure the service loops are remade and secured in their proper places. The Offshore Petroleum Discharge System (OPDS) is a part of the Strategic Sealift's cargo delivery system. OPDS is designed to facilitate the high volume movement of bulk liquid cargo from tanker to shore in support of Fleet Marine Force amphibious operations. Deployment, recovery, and maintenance of the OPDS will be conducted by PHIBCB personnel in conjunction with UCTs. UCT personnel have the responsibility to deploy, retrieve, maintain, and repair parts of the system which require diving support. OPDS was designed to be installed and carried to the deployment site on a specially designed tanker. It is shown ready for deployment in Figure 6-32 and denloved in Figure 6-33. The OPDS consists of a conduit which delivers the fuel to shore, Single Anchor Leg Mooring (SALM), and towing, handling, and support equipment. • OPDS - SALM, "Deployment and Retrieval Manual"
• OPDS, "Conduit and Conduit Support Equipment Operations, Maintenance, and Storage Manual"
- ing deployment, recovery, maintenance, and inspection of die SALM, including site selection, stabilization, inspection, and maintenance of the conduit to the beach. All operations involving the need for divers involve UCT personnel. The OPDS is complete in that all project equipment necessary to facilitate deployment, maintenance, and operation is contained with the system. Even so, it is imperative that UCT personnel conduct a thorough survey of the equipment to establish presence and operational condition. On-site camp support will be provided by the PHIBCBs. The UCT detachment will be required to take the organic TO A equipment required to support surface-supported diving operations, including the requirement for surface communications. Deployment and recovery will require a team of divers working around the clock. Within 7 days of the OPDS tanker arrival, the SALM can be installed. However, weather and site conditions may dictate the need for additional time and effort. Current OPDS plans call for two full detachments to be deployed with each installation. Due to the around-the-clock nature of the task and other environmental factors such as depth and site conditions, deployment and recovery operations may require deployment of up to two Air Detachments (30 men). The detachment leader will need to carefully evaluate the overall operational situation before establishing the deployment team size. A brief outline of UCT participation in OPDS deployment is provided in Table 69. Detailed procedures and requirements are specified in the manuals. Deployment of the SALM is expected to take 7 days but could be longer depending on weather, site, and operational conditions. Following deployment, a UCT inspection and maintenance crew adequate for operating a dive station may be required to remain on site for up to 6 months. Recovery and preparation of the SALM for redeployment can be accomplished in 5 days.